One person might come in from work to their flat on a cold day, put the kettle on and sit in an armchair in front of the television. She does not turn on the 26 Kw gas central heating, which has an “energy-saving” gas condensing boiler, newly installed by her housing association because this takes an hour or so to heat the flat. Instead she switches on a 600 watt electric halogen heater, which is pointing at the armchair. When she has warmed up a bit, she goes to the colder kitchen to make a cup of tea and get something to eat and goes back to the warm armchair. Another person might have a dispute with his electricity supplier and have no power in his flat. He might stay in a warm friendly gas heated pub then go home and get into bed. He remains reasonably healthy by eating raw food at home. The carbon emissions for keeping flat, pub and caravan dweller warm are a small fraction of that necessary to heat a dwelling to the “fuel poverty” level. These examples are not typical. They do not have children living with them and one could afford to stay in the pub for the evening – trying to drink slowly, of course. However three messages shout out. First, people find ways to keep warm by creating micro-climates in their homes (e.g. halogen heater and armchair). Second, the slightly more affluent can enjoy the communual warmth of the pub. Third, living in a small space can be economically warm and need not feel horrible and cramped. And importantly they all have small carbon footprints. Having spaces in buildings that have different environmental characteristics allows movement from one to another for a change. For example, people can move to a cooler room when they feel a bit “stuffy” or to a warmer place when they feel chilly. I live in quite a large old flat having sold my house recently. I mostly live in one large room – just occasionally going upstairs. This room has three large windows. These are hardly draught proof but they do allow a good amount of light in – and for some part of the day sunlight. The landlords could double-glaze the windows but that would mean less air-changes, more difficulty in opening windows and in the case of this old building significant expense – it would be a custom job and I would have little confidence that it could be carried out to my satisfaction. The hearth was used for cooking, and its enclosing alcove became a natural place for people seeking warmth to gather. With changes in building design, kitchens became separate rooms, while inglenooks were retained in the living space as intimate warming places, subsidiary spaces within larger rooms. 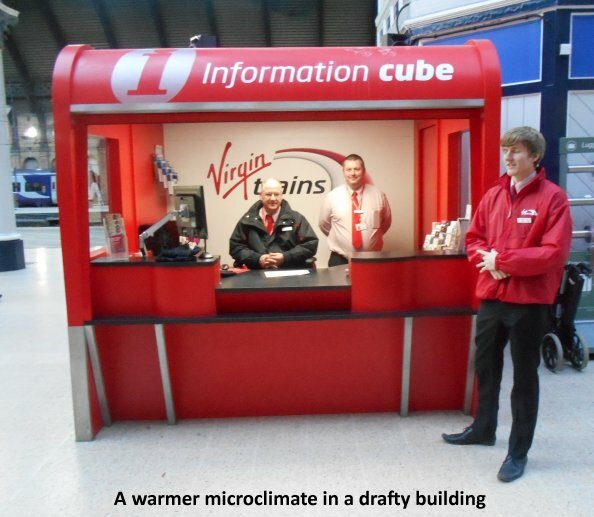 Using physical barriers to change the local environment within buildings is a good starting point for the research but rigid fixed structures – even with adaptive cooling or heating – may be extended by dynamically adaptable barriers like, but not restricted to, self-closing doors or barriers. Standard parameters of the physical determinants of comfort within buildings include temperature, humidity and lighting levels. Other parameters such as the concentrations of VOCs (volatile organic compounds) may be added. The existence of sick building syndrome shows there is incomplete understanding of comfort in buildings, especially in modern ones. However, these problems are not new. For instance I remember moving from an old school building to a building where classrooms were designed to the 2% daylight factor principle. This meant on certain days it was impossible to read the page on the desk because it was swamped by blinding sunlight. It was much less visually comfortable than the old school that would have failed the 2% test. Other comfort-related parameters are rarely used e.g. a gentle draft affects the perception (and reality) of a room temperature which is too high. There are other factors such as visual or acoustic properties that have a real effects on comfort, which are difficult to predict at the design stage. The retrofit of old buildings for the comfort of occupiers is a design issue and it is too complex to be put into a methodology based on simple measures like temperature or air changes. However, before any design guides can be written, research is necessary. I think what is needed are practical examples (e.g. the modern inglenook) that can act as simplified models on which to base design principles and practice. We have new ground to cover. The old approaches just are not sufficient. Perhaps methodology of the Marshmallow Challenge should be applied: Build some simple prototypes and test – but we should also look at what people on restricted budgets do.